Chen Yunlin, right, the head of a semi-official Chinese agency, shakes hands with Taiwan's envoy Chiang Ping-kun, chairman for the Strait Exchange Foundation, during the fifth Taiwan and China trade talks in Chongqing, China, on Tuesday. (CNN) -- Mainland China and Taiwan signed a historic free-trade agreement Tuesday that is expected to strengthen ties and reduce the potential for cross-strait tensions. Officials signed the Economic Co-operation Framework Agreement, or ECFA, in Chongqing, China. Under the deal, China will cut tariffs on 539 items from Taiwan valued at $13.8 billion, or about 16 percent of the island's 2009 exports to the mainland. Taiwan will cut tariffs on 267 items from China worth $2.86 billion, or about 10.5 percent of the country's shipments to Taiwan in 2009. 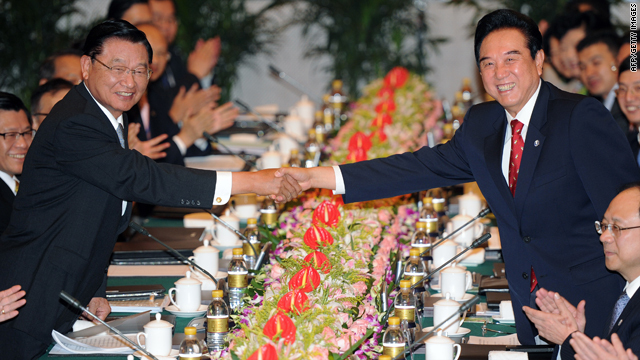 The deal is a major step in easing tensions six decades after China's civil war. Taiwan began as the remnant of the government that ruled over mainland China until a Communist uprising proved victorious in 1949. China considers Taiwan as a breakaway province and does not recognize it as a sovereign nation. "It's really a milestone in the economic relationship between both China and Taiwan," said Frederic Neumann, an economist with HSBC in Hong Kong. "Some of the other ASEAN economies have free trade access to China, thereby can integrate more competitively with China and Taiwan always faces higher trade barriers," Neumann said. "By removing these trade barriers, Taiwanese firms can compete on an equal footing with firms in Southeast Asia." The landmark deal will strengthen ties and lay a foundation for growth, analysts say. "The EFCA will have a great impact on the mutual economic development of Taiwan and China," said Chen Yunlin, chairman of China's Association for Relations Across the Taiwan Strait. "With regards to the economic development of both sides, this treaty will act as a foundation for the peaceful development of our relationship." Chiang Pin-kung, chairman of Taiwan's Exchange Foundation, said the current global economic crisis calls for cooperation between both sides. "And I'm sure this treaty could create a win-win situation for both sides and we would all benefit from it," Chiang said.